Nobody believes in the power of a fabulous smile more than the team of experienced professionals at Sugar Fix Dental Loft. While we offer a variety of exceptional general dentistry, restorative dentistry, and cosmetic dentistry treatments designed to restore, improve, and maintain the health and beauty of the mouth, we believe firmly in the old saying that an ounce of prevention is worth a pound of cure. 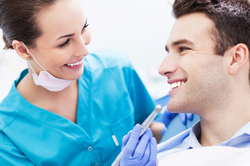 In the case of dentistry, that means visiting our dental loft regularly, at least twice a year, for professional cleanings and thorough exams so that we can keep your mouth clean, and we can identify and treat potential problems in their earliest possible stages, before they have a chance to progress. At Sugar Fix Dental Loft in Chicago, dental exams allow us to keep our patients’ smiles clean, vibrant, and healthy. We think that you will find your visits to our dental loft so pleasant and relaxing that you’ll be disappointed that they occur only twice a year. Ultimately, however, by maintaining these routine appointments, you will find yourself saving a lot of time and money while avoiding serious oral health problems such as periodontal disease, tooth decay, and root canal infections. There are many benefits to having regular dental exams, especially if you are currently in excellent oral health. Even the healthiest mouths are filled with bacteria and vulnerable to disease. Once the tissues of the mouth become even slightly damaged, oral health can begin to degrade extremely quickly. Preserve your gum health: Nearly three-quarters of American adults have gum disease, yet most don’t realize it. This is because, in its earliest stages, gum disease does not produce clear symptoms; yet, as it progresses, it can become unbearable. Regular dental exams allow us to detect and treat gum disease in its earliest stages. Detect flaws in the teeth before they become visible: Our advanced diagnostic technologies allow us to “see” microscopic structural flaws in the teeth before they erupt into full-blown decay. Identify tissue abnormalities: Oral cancer is actually one of the most treatable forms of this horrible disease – if it is caught early. Regular oral exams allow for abnormal tissues to be identified and tested. In most cases, tissue abnormalities turn out to be harmless, but in some cases, simple dental exams end up saving lives. Make you look and feel great: You’ll leave our office with a clean, healthy smile. If you have any oral health issues, you’ll know exactly what they are and how we plan to address them. If you don’t, you’ll have peace of mind. It’s a true win-win situation! To schedule your dental exam at Sugar Fix Dental Loft, please contact our cosmetic and general dentistry practice today.